The stars of this table, of course, are the elephant plates -- love it that they are square. 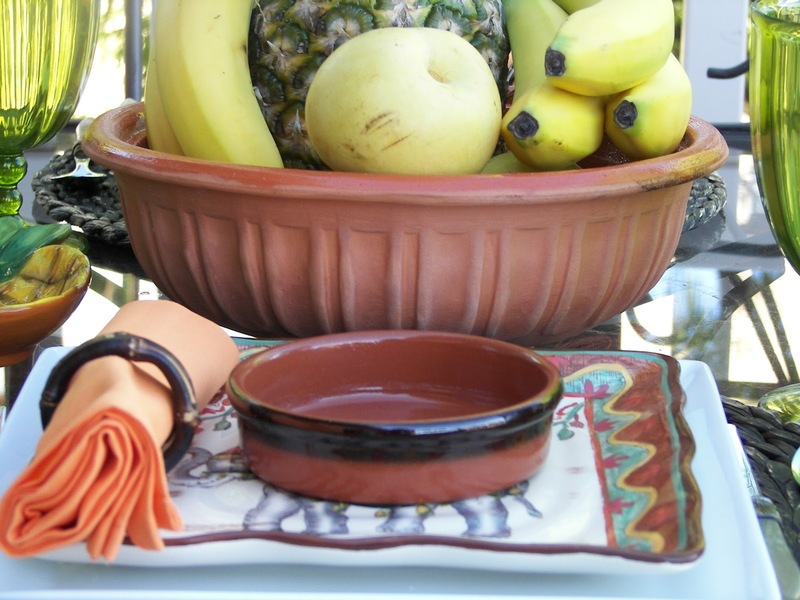 I placed the fruit in the terra cotta baker. Shhh!! Don't tell anyone, but when I bought the Asian Pears, I thought they were yellow delicious apples ;)! I can't wait to make some roasted vegetables in the baker in the fall. "Grandma;s" roaster, with a cover, was $3.00. I love "Grandma's flan dishes. Most like creme brulee will be served in these bakers. I recently saw some bakers like this in a Spanish importing catalogue. They sold "Grandma's" for 5 for $2.00. 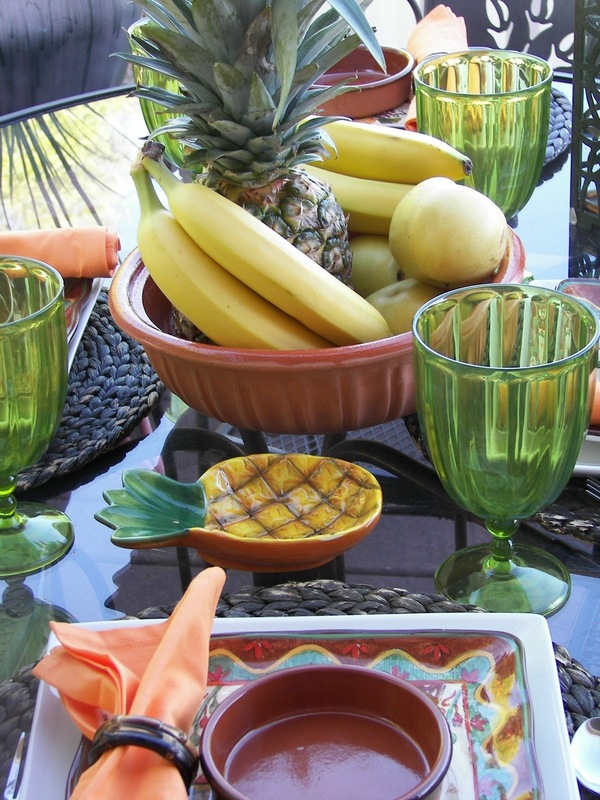 Love the pop of the orange napkin which provides a tropical feel, don't you think? The green goblets are plastic and were on clearance for a dollar at Wal-Mart this spring. I set the new orchid plant my husband brought home for me. Better get a shot of it now, it will die soon, under my care ;). White Square Plates -- A gift from my sister Jean who when she found out how much she would have to pay to take them home on the plane, she gifted them to me at curbside parking. Terra Cotta Baker (the fruit basket) -- "Grandma"
Gorgeous table! Love those elephant plates. It's very Asian and bold. Thanks for sharing. Wow! I think I would have gone back to that garage sale twice. You really did well. I really like those elephant plates. Those are great! sounds like an awesome sale you found! 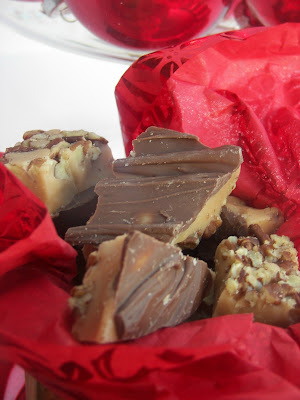 Come and enter my giveaway! Reminds me of the old movie The Elephant Walk. They are so exotic. How fun! You wouldn't know the goblets were plastic if you didn't tell us that they were. They have such amazing plastics out there now. The little bakers would be wonderful for queso too. What a nice orchid. I actually had a friend who got hers to rebloom the next year. I am not that patient. It is just lovely. The economical elephants are my favorite kind. 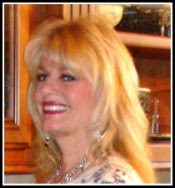 I love to find a great piece at a thrift or garage sale and go to town. Since I'm an unashamed lover of orange and terracotta and all those colors, I'm particularly fond of this one. Those elephant plates are wonderful! Love the elephant plates! I've never seen any like that before and just adore things that are different! Your table is so darned cute, Joni! The elephant plates have some great colors you can build around...like the orange and green you have used. Beautiful orchid, too. What treasures you found! The elephant plates are so unique. Great colors! Elephant plates certainly different and kind of unique I love them..the table looks wonderful and I like the great glasses..O where is the roaster. Great buys, Joni! I love the elephant plates. Hi Joni, Love your elephant plates, the flan dishes and the pineapple dishes. 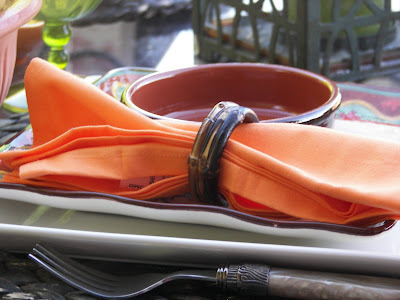 You're right, those orange napkins add a beautiful pop of color! Nicely done. Love this quirkyness of the elephant plates. Can I come over when you make the flan? 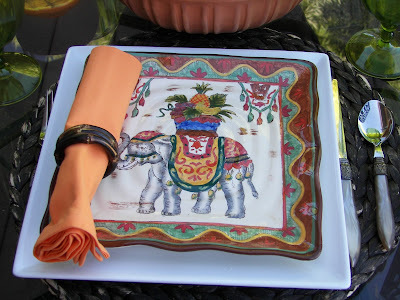 Cute table -- LOVE your elephant plates! I love finding "grandma's stuff" at thrift stores and goodwill. Just beautiful, what time should I arrive? LOL! I love your setting, and the china is just glorious. You always do such a good job with these tablescapes - inspirational for sure! The plates! The plates!!!!!!!!!!!! Love them!!! 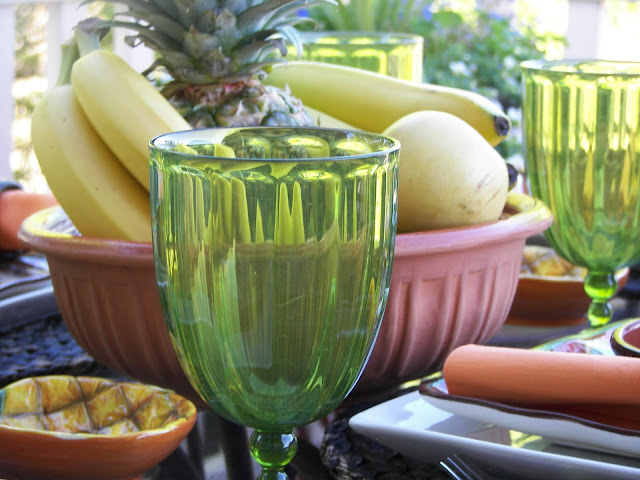 They look great here for a summery table, and they would look fabulous on an Indian-inspired table, too with all those great colors. Wow! Score!!! I need a vacation, clearly. I love that your table is economical. And I would have loved to have found those terra cotta bakers for that price. I can see all kinds of things in them...casseroles, brullee, paella, they will come in handy. I don't go to many garage sales either, but once in a while you can tell they are going to have "good stuff"! It looks like you hit a good one. 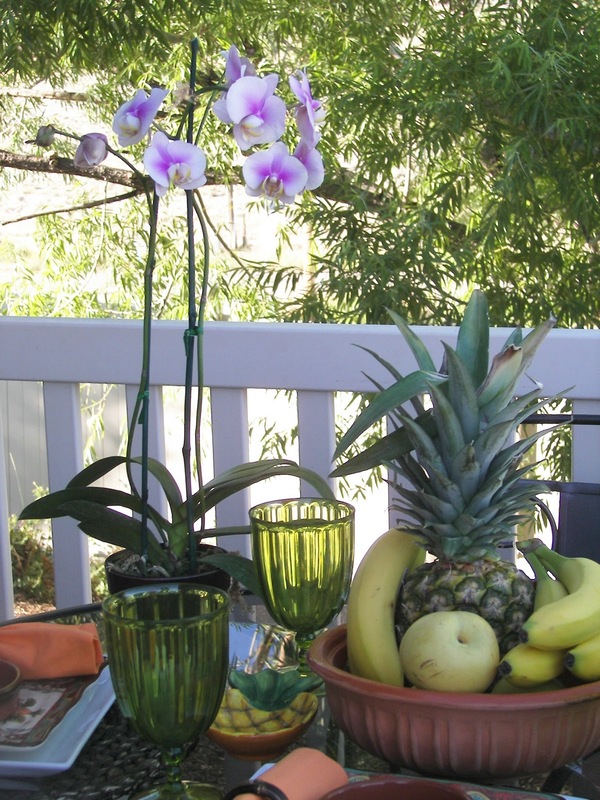 I really love how you did the simple centerpiece with the pineapple and matched it to the pineapple dish. It is very tropical and still elegant while being fun! What fun plates! To get them for such a deal is even better! I love browsing yard sales and thrift/vintage shops. Adorable plates..so much fun. In fact, the whole table is fun.